Beta Testers: Candice Archie, Paul Badics, Felicity Banks, Mouse Bowden, Aileen Chua, Emily Conn, Dustin Curtin, Jennifer Cutshall, Georgia Darcie, Mike Harrison, Amril Haziq, Jaime Herrera, Maxine Janerka, Electra Jones, James Kircher, Alexandra McCarthy, Oscar Møller, Cody Percell, Ed Phillips, Matt Potter, Ramidel, Kari Riihimaki, Telsiya Rudolph, Jared S., James Spencer, AJ Solis, Horace Torys, Troy, Kristijan Turković, Barbara Vogler, Mike Walter, Megan Weeks-Marshall. 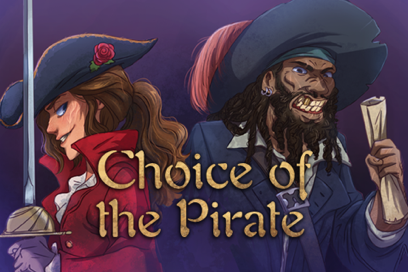 "Choice of the Pirate" is Copyright 2016 Choice of Games. All rights reserved. Alana Joli Abbott is a novelist and the game designer behind Choice of Games titles Choice of Kung Fu and Showdown at Willow Creek. She is the author of three fantasy novels: Into the Reach, Redemption, and Regaining Home, and her game writing has been featured in Steampunk Musha, the award-winning Serenity Adventures, and Dungeon and Dragon magazines. Although Alana is not a pirate, she does enjoy singing sea shanties, sailing, and visiting nearby Mystic Seaport in Mystic, CT, where she is sometimes known to say "Arrrr!"